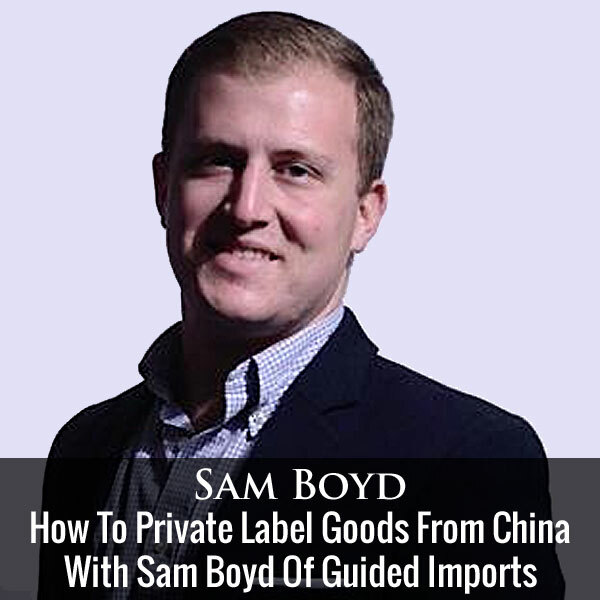 In this episode, I have Sam Boyd of GuidedImports.com, a company that helps others import safely from China. Now in the past few years, more and people have been jumping on the Amazon private labeling bandwagon so I brought Sam Boyd on the show to give us his unique perspective on the Amazon gold rush. As I’ve mentioned many times in previous articles and podcasts, relying solely on Amazon is a dangerous play and you really need to establish your own branded website in order to future proof your business. Intro: You are listening to the My Wife Quit her Job Podcast. And if you are new here, it’s a show where I bring in successful bootstrapped business owners to teach us what strategies are working and what strategies are not. Now I don’t bring on these famous entrepreneurs to simply their celebrate their success, instead I have them take us back to the beginning and delve deeply into the exact strategies they used early on to gain traction for their businesses. Now if you enjoy this podcast please leave me a review on iTunes, and if you want to learn how to start your own online business, be sure to sign up for my free six-day mini course, where I show you how my wife and I managed to make over 100k in profit in our first year of business. Go to www.mywifequitherjob.com sign up right there on the front page, and I’ll send you the mini course right away via email, now onto the show. Steve: Welcome to the My Wife Quit Her Job podcast, today I’m really excited to chat with Sam Boyd of guidedimports.com, a company that helps others import safely from China. Now in the past few years more and more people have been kind of jumping on the Amazon private labeling band wagon. So I brought Sam Boyd on the show to kind of give us his unique perspective on the Amazon gold rush. Now as I have mentioned many times in previous articles and podcast relying solely on Amazon is kind of a dangerous play, because you are putting all your eggs in one basket, and you kind of really need to establish your own branded website or business in order to kind of future proof your business. And with that welcome to the show Sam, how are you doing today man? Sam: Thank you so much for having me Steve, I’m doing great, how are you? Steve: Very good, so tell us about Guided Imports, so what do you guys do, and why did you start this company? Sam: Yeah sure, so to put it simply, Guided Imports is a company that helps people get products made in China and safely and easily get them shifted to their destination country to be sold. So we started as just a regular sourcing company and what that means is, larger businesses and brands who don’t necessarily have the means of having their own purchasing office in China, we started out as being very dedicated purchasing office. And through the time of us working with these clients, we realized that there was a huge market for people who were interested in selling on Amazon and also selling on ecommerce. So at about a year after we were established as our first sourcing company, we launched Guided Imports. And guided import’s goal is to help buyer or help sellers on Amazon purchase products and get them manufactured in China and seamlessly deal with everything on the China side to get them over to Amazon warehouses, and to be sold on Amazon. Steve: So Sam if I went up to you and said, hey, I want to sell cell phone cases for example, you would just take care of it from there after I give the specifications? Sam: Yeah, I mean that’s the ideal goal right? So essentially the way it works is we offer the seamless service that allows people to tell us exactly what it is that they are looking for. We sort of walk them through the information that we need to know. And we come back to with them with reports telling them okay this is how much we think it’s going to cost. This is what it’s going to cost to do to get the products through customs and pay the duty in taxes. These are the necessary certifications you need and ultimately give you an idea of the entire process and then start working from A to Z, so exactly what you said. Steve: And this is probably getting a little too specific I was just curios. The way you guys get paid is it like flat fee or do you take cut off of each product? Sam: Great question, so the way that — so what we do is — to put it simply this is a sourcing company there’s a lot of companies out here, we just try to give it a different approach. And what a lot of sourcing companies do is they’ll take some type of commission, they’ll charge percentage on top of the total sales or multiple payment structures. What we try to do is we have just one flat fee that you pay and we handle everything, we are your eyes, ears, boots on the ground, and that’s all you necessarily have to worry about. Steve: Okay, so let’s get into kind of like the Amazon space I know a lot of people just been kind of jumping on the Amazon band wagon, and they’ve been just been making mistakes left and right in sourcing. I was just kind of curious what your view you probably see this more than I do but what is your view of just kind of selling on Amazon today? Sam: So selling on Amazon is the phenomenal business model, it’s really the first platform where anyone can seemingly find a product, get it made, and sell it to the end user. The problem that we are seeing are importing is a serious game. It’s not just about finding a product, and for your example cell phone cases, and saying okay, I’m going to get 3000 of this made and start selling them. There’s a lot more that goes into it, and well, there are a lot of guides that are teaching people how to safely import, they are leaving out a lot of important information. And it’s really causing some Amazon sellers to feel the wrath, because Amazon is getting stricter. And they are starting to essentially ban users for not complying with rules and regulations through Amazon as well as through import regulations. So while selling on Amazon is a great model, it really needs to be done carefully and properly. Steve: Yeah, I have just noticed I think they just went through another banning wave like a month ago right? Where they just banned a whole bunch of people and they removed a lot of reviews as well. Do you happen to have any insight on why they were banned? Sam: So essentially one of the biggest concerns is safety. Amazons customer is the end user, it’s not the seller. And this is the reason why Amazon is starting to teach factories how to sell on Amazon. Is because they want to minimize this risk of exposure that they have to products that are not necessarily safe and they don’t have the proper licenses and things like this. So a big example is anything that is food related, whether its food itself or a product that’s used in cooking, needs a certification through the FDA, if it’s being sold in the US market. Many people see this as something that they can just skip passed that they think well, I can get it — I can get this product, that not necessarily need me to spend a couple of 100 dollars on the FDA certification. I can sort of just hope it slips through customs, start selling it on Amazon, and I figured that I have such a low volume that no one’s really going to catch me. Well this is a perfect example, but when we look at it it’s not just an FDA certification that people need for products, there’s tons and tons of certifications. And there’s so many to the extent that there’s — it’s a customs brokers job, it’s their profession to have an understanding and to advice people on all the necessary certification. So one of the biggest things that I see people getting banned for is, lacking this necessary compliance regulations and certifications, it’s ultimately let’s assume that you are selling baby products. And you don’t get the products tested to make sure there’s let’s say — to make sure that there’s no lead in the product itself. This is a huge issue, because you are responsible for putting these products in the hands of children. A lot of other people that are selling are mothers and fathers themselves, so at least I have a family and they are neglecting these major concerns. That a major importer or someone who knows how to import would never do, but because people are just reading quick guides or just looking through forms and seeing how easy it is to sell on Amazon, they completely neglect this stuff and what’s happening is they are getting banned. Steve: Okay, I have actually heard other stories about Amazon kind of cracking down on customer service and quality of products as well. Which is why if someone gets too many complaints after X number of sales, Amazon just doesn’t want the seller in the system anymore even though they might have a pretty decent track record. Sam: Yeah, absolutely and that’s within reason, I mean there’s – it’s funny you asked me for what my theories are or what my thoughts are, there’s a lot of them Steve. That’s another one, its quality control. Quality controls, having an inspector, a third party inspector go to your factory and check the goods and test the goods cost usually under $300. But someone who is working on such tight margins might neglect doing this and what’s happening is they are going to get — their products are going to get banned because the products themselves don’t meet the necessary quality control. They don’t meet the necessary quality that the end users want to get in returns. So it’s even easy for a long time seller to get banned as well for just saying I don’t want to spend $300 on QC. QC is quality control, and just because I’ll assume my supplier is good, I have worked with him in the past, I usually get good products, it doesn’t work like that. With manufacturing at least you really need to be one step ahead of the manufacturer at all times. And it’s costing people just like you said their accounts and essentially their business. Steve: I mean I can talk a little bit about personal experience here, from production run to production run, we always go through everything. Because the materials might have changed, someone else might have been working in the line different set of people and the quality always varies from production run to production run. So let’s talk about some of these common mistakes that some of these newbie Amazon sellers are making, what are some of the problems that you’ve been seeing? Steve: What does that mean exactly? Sam: Alibaba is a great platform to find factories; it’s what some people would say it’s the ideal platform. But a lot of people put too much faith into Alibaba, or suppliers on Alibaba because someone has a gold ratings, a [inaudible 00:13:26] that they paid Alibaba. And have that says we’ve been a perfect supplier for ten years, or we’ve been perfect supplier for five years. So one of the mistakes is with sourcing, so sourcing is searching for factories, finding ideal factories, that’s a serious problem is that they are finding the wrong factories, or they are finding factories that are not necessarily qualified. And what is happening is they are facing all of these problems that we just spoke about but these problems could have easily been avoided had they found a proper factory or a factory that’s specialized in the product that they want to sell to be sold in the market that they want to sell. Steve: So let me ask you this since we are on the topic, so what is the right way to find the proper factory to manufacture a specific item? Sam: That’s a good question, so it’s … I don’t think you are going to like the answer because it takes a long time to do this. What we like to — the way we like to explain finding a factory to manufacture your product is to cast the white net. So speak to as many factories as you possibly can and what I mean by this is speak to a hundred factories and rapidly narrow down these 100 factory list into more qualified factories. Until you are getting down to approximately five factories that you’ve been able to personally vet and personally qualify and say of the 100 factories that we spoke with, these five we fell meet all requirements that we need. And one of the most difficult and serious things that someone who is new to finding these factories needs to understand is, the very last thing you want to be looking at is the price of the product. A lot of people just look at price first, and then find a qualified factory based on price but it’s really the opposite. Steve: What are some of the criteria that you use to go from a hundred down to five for example? Sam: Sure, so some of them can just purely be how a factory responds, what’s the response rate, but other ones can be more serious ones looking at their products, so there’s hard factories that you can put into place. If you are looking for cell phone cases for example and you see that a factory sells everything from microwaves to wallets to cell phone cases, that’s not necessarily a good thing, because it’s telling you that supplier does not specialize in one criteria. They are trying to just throw — they are just trying to throw a bunch of stuff on the wall and see what’s sticking. So if a factory has multiple items that are in completely different categories that would be a factor that would make you say, okay, we don’t want to work with them. Steve: Okay, they are probably not a factory either right, because they are probably not making their own stuff at that point either? Sam: Yeah, there’s definitely a possibility that they are not a factory. And yeah, I try to use the word supplier and not factory because a lot of people have this idea that I’m going to China or I’m going to Asia and I want to get products manufactured. I need to go to a factory because I don’t want any middle man. And it’s kind of a harmful thought process because it really minimizes your options, so one of the things that you can always look for is if they are some type of middle man, a trading company it doesn’t mean that they are bad, or it doesn’t mean that they are priced any more expensive, it just means that they are purchasing for maybe a factory that doesn’t necessarily have the means to do international export. Sam: I would say there’s a lot of criteria we list them on our blog, but one of more important thing that I would say, is focus on the export market that these factories manufacture for. So if you are going to be selling in the US but a factory says that 80% of their sales are to India, that’s not necessarily a good thing because the level of quality on products is different per country. And comparing India to the US in terms of quality is you are going to see such a huge difference that you want a factory that completely understands the western market, and it’s not selling just the lowest possible price, they are more focused on quality. Steve: Okay and what services would you recommend to find vendors you mentioned Alibaba already, but do you have experience with like Global Sources, going to trade shows, using some of these import services like Panjiva and Import Genius? Sam: I’m a huge fan of Global Sources, I love Global Sources, and I think for the newer importer, Global Sources does not get the amount of recognition that they deserve. Because the search features alone in Global Sources are a lot better for the newer importer. You can basically choose — as a newer importer you can basically choose how big of a factory you want to work with. And if you are ordering a small quantity, it depends on the product but let’s say for these cell phone cases 5,000 cell phone cases, you don’t want to work with a huge company or a huge factory that’s selling also to best buy and radio check. You want to work with someone who is a little bit more in line with your business model, or with the size of your business. And Global Sources is using their star ratings, it’s a very simple way to just read out these giant factories, we are going to have huge overheads and they are going to charge that on top of the — they are going to cover that through the product price. Other services yeah, Panjiva is great import, where as Import Genius is also good. They are good for identifying if there’s a brand that you want to know the factory, that they came from, that the product came from; those services are good for an Amazon seller. I don’t think it’s necessary to pay the hundreds some dollars a month for the service when most of this information can be found online anyway. So then there’s also websites like made in China, which is also a pretty good. And then trade shows, the canton fair is coming up soon in Guanzhong in a couple weeks, Guanzhong China. And that is a great way to get product ideas but for a small seller it’s difficult to really use these companies, because these are some of those bigger factories. They are selling to Home Depot they are selling to Wal-Mart, they are clients, and they are searching for these big companies to put in multimillion dollar orders. And I don’t really think most Amazon sellers are ready to do that at this point. Steve: Interesting every time we go to the canton fair we managed to find a bunch of small guys who are willing to work with us at least. So that’s interesting I guess it probably just depends on what products that you are trying to sell. Sam: Absolutely, I bring clients to the canton fair and we are usually able to find some factories or some trading companies that are good. But nine times out of ten if not more, the prices that they come back, using our sourcing services we are able to beat their prices just through finding other factories. Steve: Okay so for the little guy then where do you suggest finding sources for private labeling? Sam: To find little guy? Steve: Little guy someone starting out, they have a budget of maybe like five grand to start. Sam: So someone in that range, Alibaba, Global Sources, are great if their budget is five grand, I don’t see how they could justify paying the five grand, it’s going to take for them to get to China. Steve: Oh, I meant like just for products like initial inventory just to start with yeah. Sam: Alibaba, Global Sources, these are two good locations to source suppliers if you want to do it on your own. There are services that help you do this, one of them is Guided Imports, but sourcing companies are there. The thing that most people will find when they run into sourcing companies is for a smaller buyer, it’s sometimes difficult to work with their margin and see a profit. So what I would suggest is if you are new, take your chances and get your feet wet using what’s available, using the databases that are out there, and from there scale up. Steve: So to use a sourcing service such as Guided Imports, what would you typically be willing to spend, or what should you be willing to invest? Sam: This is a good question because a lot of people think from a monetary standpoint and ultimately that’s completely understandable, because it’s their business, all they care about is the bottom line. But one of the things that they are really investing when they are using a sourcing service similar to Guided Imports, is they are investing money or the saved time. Traditionally if you were to do this on your own, it’s going to take having to speak with up to nine different services just to get your product idea to market to be sold on Amazon. And this is counting working with factories, working with quality control teams, doing what it just takes, all the stuff. When you are looking towards a sourcing service, it’s — the biggest investment here is the amount of time that you are going to be able to save. Because ultimately a service like this is — they are focused on handling everything for you. So you can sit back and allow your business to grow where it matters which is your customers. Sam: You did mention $5000, I would say that can be a good starting point for someone who is interested in using one of these sourcing services its $5000. But we see buyers who are ready to — or looking to spend twice that or if not five times that amount on orders. So it does depend on the product, it depends on the kind of business you have, how much time do you want to dedicate to sourcing. Steve: Okay, and just speaking with a bunch of Amazon sellers, people will tend to email me their problems and one big problem that they have is quality control. And so I was wondering if you have any inputs on kind of ensuring a consistent quality of product from under run. Sam: Sure. So in regards to quality control, there’s a lot of great quality control services that will do inspections at the factory or at the supplier’s warehouse prior to the goods getting their final payment. But what someone really wants to ensure is that they have what I like to call to a quality gates throughout the entire process. So what that means is not only are they doing quality control the very end but they have some type of quality assurance through every step of the process. So one of the quality gates that I mentioned is when you are sourcing a product, it’s finding that qualified supplier. Another one can be ordering samples. You always want to order samples. Another one can be doing preparing proper– we call product manuals which is like a purchase contract or purchasing agreement. So all of these things give you a safer and more qualified understanding, that the product that you intend to purchase is going to be the product that you are going to get. Quality issues still happen and I think the ultimate way to prevent that is to have someone look at the goods before they are ever shipped out of the manufacturing country. But by having your checks and balances in place, even before that happens, you can really minimize the potential of bad quality. Steve: This is a very general question. I’m not sure you are going to be able to provide a good answer but even though we have some of our stuff looked at; we still end up with defects when we get our final order. What is typically an acceptable defect rate or a reasonable defect rate? Sam: It’s a good question. This is really going to depend on the product. It’s really going to depend on the product. If your product has very few moving pieces, if your product was cast from a single mold, from a single material, you’d expect the defect rate to be a little bit lower than something that has multiple moving pieces maybe an electronic component. One of the things that you can do to get a better understanding of this is ask your supplier what is the expected defect rate. And asking them what do they consider a reasonable amount of defects. I would say, anything, defects are going to happen. Nothing in this world is perfect. The way manufacturing is done today, you are going to get defects. The goal is really minimizing that amount. So what I try to look for is for most consumer grade products, you want to try to shoot for a defect rate under 3%, usually even more than that. I mean if you can work with half of a percent, then you are in good shape. Steve: Oh, half of a percent. That would be incredible. Sam: That would be phenomenal, right? Sam: And that can be done too if a factory has their, uses the proper techniques for their own quality control. So one thing that a lot of importers don’t necessarily understand or don’t yet know about is that there’s something that is called QMS stands for Quality Management Systems. And there’s a text book criteria for how a factory handles quality control in-house. They can get certified on certain types of quality control. What this certification say is that that the way that they do quality control equates to a certain level if not less, or a certain level or less defects than if they were just to do what someone would say in-house. Does that make sense? Steve: Kind of. Can you elaborate a little bit more? Sam: Sure, so one of the most basic ones and for some of your listeners who are interested in this they can always quickly look it off, is that ISO9001. So this is basically saying the way that our factory tests their product is only a certain amount of defects are going to make it to the final production. So this is a phenomenal quality gate that people can use that if a factory is certified in ISO then they can say, not only do they care about quality control, but the factory has these necessary techniques to test the quality. Steve: Okay, fair enough. Lets a step back a little bit and kind of just talk about how someone who’s smaller can actually even get the attention of a supplier to work with them. Do you have any tips there? Sam: A lot of people, I see on these forums, a lot of people are saying to lie to suppliers and say that, “This is just a test order. This isn’t a big order. Our next order is going to be large.” I kind do frown on that because you, you are basing your relationship with the supplier off of false hopes, and that’s not really a great way to get into a business relationship with someone. I would say instead of trying to get larger factories to look at someone who’s looking to—who only has the means of placing a small order, I would say, well a lot of people aren’t going to like the answer to this, it’s focus on the type of suppliers that are interested in working with them. So someone who only has a couple of thousand dollars to spend might want to look more towards a trading company who has the means to work with their smaller quantities. Steve: Yeah, what I usually tell people also is, if their quantities are super low, just go on AliExpress, and just get your feet in the water. Sam: Absolutely. I mean AliExpress, Dhgate, there’s a lot of viable options for someone who’s just trying to get their feet wet, absolutely. Steve: Okay. Lets switch gears once again and just kind of talk about Amazon. I think one of the reasons we got into contact was I think one of your coworkers read my post on Amazon horror stories, and I just kind of wanted your take on just focusing all your efforts on one channel as opposed to kind of broadening, selling to the retail space, selling with your own shop and that sort of thing. What you are kind of seeing out there now? Sam: Amazon is not going to—Amazon is a big company. They are ideal. Their customer is the end user. It’s not these sellers who are trying to make selling on Amazon their full time income. And while a lot of people are not going to like hearing that, sellers are expendable. They are absolutely expendable. What’s happening is there– the people who are selling on Amazon were not getting banned, but the ones who are going to survive through this wave of Amazon getting stricter, or my opinion better at what they do, is if you broaden your sales channels, don’t only sell on Amazon. Amazon is phenomenal right now, they are a great market, but put yourself in a position that you have, you have the entire world to sell your products to. Don’t—putting all your eggs in one basket is not necessarily the best solution in my opinion. But for those who are focused on selling on Amazon, it’s start listening to what it is that Amazon is preaching, because their regulations and their new rules, they are not going away. Steve: You mentioned that a lot of the factories that you’ve been kind of encountering are starting to sell direct on Amazon kind of by passing the private labeler, are you seeing that more and more? Steve: And in terms of private labeling in general, what are your thoughts on the saturation level of Amazon right now? Sam: So, it’s a good question. Amazon is a great market for people who are looking to purchase products. I think everyone—it’s safe to say almost everyone who’s listening has purchased a random product on Amazon. But what we see is there are so many different variations of one product that—I don’t think that’s necessarily a good thing. There was this famous psychology experiment where this [inaudible 00:36:13] food store was—they were featuring a line of exotic and high quality jams. And customers who came to taste samples they were given a couple for a dollar off if they bought a jar. So in this one condition, the study had six varieties of jam that they were able to test and another testing, there was 24 varieties. In both testing, the consumer tasted the same amount. But when there was only six varieties, the purchase rate went up a lot more. While people like to have variations, too much variation is never a good thing. Steve: Yeah, I don’t know about you but when I shop on Amazon these days, the shopping experience isn’t as pleasant because I have a bunch of stuff that all looks the same and I kind of have to sift through all reviews in order to buy stuff. Do you see Amazon kind of cracking down and kind of reducing the choices and eliminating all these smaller guys going forward? Sam: Yeah, absolutely. The reviews that you are looking at, can you guarantee that those reviews were not written by someone who received the product for free or for 99 cents? I mean a lot of people are not really going to love where Amazon is going but what we are focused on and what people need to be focused on is that in order to get your product ranked and to stay a top product, you need to have quality. So by just following in this band wagon of, “Oh, someone is selling a garlic press; let me sell it as well.” It’s not doing any one any favors because you are just another guy and potentially you have reviews that—nowadays people aren’t really sure if these reviews are genuine. That’s not a good position Amazon wants to be in. Steve: So let me ask you this. So let’s say you are a brand new aspiring ecommerce store owner, or business owner, how would you proceed. Which market would you tackle first? Would you start out at Amazon, would you start with your own site, would you go into retail? What would be your strategy? Sam: If I was starting from day one, I think Amazon is an ideal location to at least put some type of product. It’s great for validation. If the ecommerce market is interested in buying my products, there’s a good chance the rest of the market is interested in buying my product as well. So I would definitely start on Amazon. I would also focus on selling on my own ecommerce site. I mean if you just look at it, the numbers once you are able to build up a site and have a following, the numbers are just so much more in your favor, because you don’t have Amazon taking a decent chunk out of your pockets. I can tell you, I’ve had experiences prior to moving to China in sales. It’s a phenomenal thing when you are given terms where you don’t have to pay until you’ve actually sold an item. For someone who wants to get into retail on minimal investment, go locally. Find those small stores and try to get your products in there, and maybe you’ll strike out a couple of times, but the one time that you do make a success it just flattens the door for you to get into an even bigger store the next time and even larger store. So if this remains, I will not just stick to Amazon and say, “This is where I’m going to grow everything.” I’d really focus on broadening my sales channels as much as possible. Steve: What else I like about your retail strategy is that those type of customers would be ordering on a regular basis. You don’t have to actually go out and find them again. Sam: Absolutely. Yeah, it’s amazing. It’s to be able to sell wholesale. I mean that’s your dream. As an importer and as a brand owner, do you really have to deal with customers for the rest of the life of the product? No, you want to deal with other buyers. And you want to be able to get into B to B, so you can leave B to C. leave the reviews and leave these things to the company who’s selling to the end user. Steve: Yeah, that’s one thing that you definitely cannot be doing on Amazon. Amazon is always going to be B to C, for now at least. Steve: I had kind of a personal problem that I was hoping you could help me out with. I’ve noticed that the price is in China have been increasing dramatically from year to year, so what can one do about that and is there an easy way to find suppliers outside of China like in Pakistan, Bangladesh, Indonesia or Vietnam? Sam: So, price increase in China is something that not only are you seeing but huge companies are seeing and also China itself is seeing. China just devalued the Renminbi a couple of months ago in hopes to get more foreign buyers purchasing products from factories. But what’s going to happen, China is not going to be China forever. I mean, I live in China. I love China but unfortunately, it’s not—the China that we know is not going to be the manufacturing hub of the world forever. So looking for other factories in other countries to produced goods, is something that can be done. But I think what you are going to notice is unless you are producing at the scale that allows you to get a factory to start its own production, then it might be difficult for you to look at India, Vietnam or Bangladesh. Also it depends on the product. So what I mean by this is, cell phone cases for example, most likely the reason you went to the one factory that you may be working with for cell phone cases for example, is probably because this supplier already makes these cell phone cases. By leaving that factory and going to another country, you are most likely going to have to commission that factory to recreate the molds which is a very expensive part of manufacturing. It’s a very expensive startup cost and get them to the point where they can produce the product that you were having made at the same level of quality if not better at the price that you need it to be. So for someone in your position, I would say, you can start looking at other countries but you might have better luck figuring out better ways to negotiate with suppliers currently or find suppliers who are more willing to drop their costs for one reason or another. Steve: Okay. What’s funny is some of my Chinese vendors have started opening I guess their own factories in other countries as well. I don’t know if you’ve seen that. I just found that kind of funny that they’ve actually travelled outside of their country to start other places where the labor is significantly cheaper. Sam: Yeah, there’s definitely a lot of investment in that. It’s sort of goes in my belief that no one’s really going to be the next China. It’s really once we see the serious fall of Chinese production, other countries are going to specialize in their own individual thing. So we might look at Bangladesh as textiles and that will just be the best place to get textiles. We might look at Vietnam for electronics, in India for plastics and consumer hard goods. So China is sort of—they are taking all of their eggs out of their own basket for good reason. That should be a good sign to you that if your suppliers are doing this, then their intent is to stay. That’s a very reassuring thing to have in a supplier. Steve: Okay, hey Sam, we’ve been chatting for like 45 minutes. I don’t want to take up too much of your time. Can you tell the listeners where they can find you and where they can go on Guided Imports to get more information? Sam: Yeah, sure, so you can always find me at guidedimports.com. You can email me directly at info@guidedimports.com. We are definitely very excited to be launching this new service that probably be out by the times this podcast is ready. It is truly streamlining the process of sourcing. So we are taking a product where our customers give us the idea and we are able to do absolutely everything for them where all they have to worry about is selling their products. So we will find their product, the factories, deal with the customs; deal with shipping absolutely everything, including marketing on Amazon. We’ve a phenomenal new resource that is exclusive to us, that current tastings has allowed the BSR to go from about—the products that we’ve tested on, these are the BSR has gone from the high 4,000 to number nine in its category in under 36 hours and it’s 100% in Amazon’s terms of service and it’s more what they are looking for from a seller. So we’re excited to be able to have that to our service. But if you are looking for more information we certainly have a blog as well. It’s guidedimports.com/blog. We have a Facebook group that you can search for us. I’m always open to answering questions whether it’s on a website or a blog or Facebook, or whatever you can find me. I try to be pretty open, so you know anyone who has problems or questions feel free to reach out to me. I’m happy to help them. Steve: Sam, that almost sounds too good to be true. So I’ll have to check it out. Sam: Yeah, you know what; I’m very excited for it. Yeah, it does sound too good to be true. It’s one of those things that the person that we are working with is one of the, I would say, one of the best Amazon affiliate marketers in the industry. And we’ve been able to partner with him and put something together that’s really revolutionary. This is keep in mind, this is the initial testing. This is what we are getting from the first products that we are trying. But we are sort of, all struck right now. Are these numbers real? Is this really what’s happening? While I don’t want to guarantee this will work for everyone, the tests and the products that we’ve done are, it’s looking good and it’s very exciting for us. Steve: Sounds good Sam, I will definitely be checking it out. Steve: Well, thanks a lot for coming on the show Sam. Really appreciate your time. Sam: No, Steve thank you so much, I appreciate it as well. It was great talking to you. Sam: All right, thank you, you too. Steve: Hope you enjoyed that episode. Getting your importing flow down is extremely important for any ecommerce store, and Sam’s tips were awesome. For more information about this episode go to mywifequitherjob.com/episode97, and if you enjoyed this episode please go to iTunes and leave me a review. Because when you write me a review, it not only makes me feel proud but it helps keep this podcast up in the ranks other people can use this information, find the show more easily, and get awesome business advice for my guess. It’s also the best way to support the show and please tell your friends because the greatest compliment you can give me is to provide a referral to someone else, either in person or to share it on the web. Firstly thank you for the blog/podcast. It’s an amazing resource. Have you heard any feedback from sellers who have used guided imports? They seem like a new company and i can’t find any online reviews of their services. Can you verify that they actually offer the services they claim? They seem like a great resource, but just trying to learn as much as i can before handing over any money. I have never used their service before but I do have a student using them and I’ll let you know. Btw I can see all other fake 5 star feedbacks.. possibly posted by his Pilipino call centre girls.